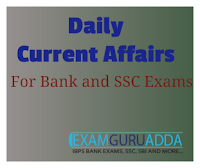 Dear Readers, we are presenting Daily Current Affairs for All Exams- 15th December 2016. 1. Union Minister Jayant Sinha today said the Cabinet Committee on Economic Affairs (CCEA) has approved disinvestment of 100 per cent stake in helicopter operator Pawan Hans. 2. A joint venture between the central government and state-owned ONGC, Pawan Hans has a fleet of around 46 helicopters. 1. The Union Government has launched Lucky Grahak Yojana to encourage consumers and Digi Dhan Vyapar Yojana to encourage merchants for transition to digital payments. 2. These award based schemes were launched by the NITI (National Institution for Transforming India) Aayog, government’s policy think-tank. Under it, consumers making payment through digital mode will get chance to win minimum Rs 1000 each every day or Rs 1 lakh per week. 15,000 winners will get cashback prizes of Rs 1000 each every day starting on 25 December 2016 (Christmas) and ending on 14 April 2017 (Babasaheb Ambedkar Jayanthi). This scheme is for the merchants across the country. Mandatory for merchants to have POS (Point of Sale) machines for undertaking cashless transactions. Under it, merchants doing business using POS are eligible to win Rs.50000 per week from 25 December 2016 to 14 April 2017. 1. Prime Minister Narendra Modi was placed at 9th position among 74 of the world’s most powerful people list released by the Forbes Magazine. 2. The list gives the annual ranking of the World’s Most Powerful People on the basis of their financial resources, scope and use of power and the number of people they impact. 1. Pakistan Army has successfully test fired an enhanced version of an indigenously-designed Babur cruise missile. The missile incorporates advanced aerodynamics and avionics that can strike targets both at land and sea with high accuracy. 2. The missile has been named after the first Moghal emperor. It is a low flying, terrain hugging cruise missile. It is part of Babur Weapon System version-2 which is an important force multiplier for Pakistan’s strategic defence. 1. The seventh edition of India, Maldives bilateral EKUVERIN Exercise 2016 began at Kadhdhoo, Laamu Atoll, Maldives. The aim of 14 day platoon level joint military exercise is to conduct military training between armies of both countries with emphasis on amphibious & counter insurgency, counter terrorism operations. 2. In this edition of exercise, Indian contingent is represented by BIHAR Regiment and a similar contingent strength of the Maldivian National Defence Force. 1. The Union Cabinet has approved memorandum of understanding (MoU) between India and Kyrgyzstan on cooperation in field of agriculture and food related industry. The proposed agreement covers various activities in the field of agriculture and allied sector. 2. It includes exchange of information and experience in field of research, animal breeding, Avian Influenza and Foot and Mouth Disease (FMD), veterinary medicine.